An antimicrobial is an agent that kills microorganism or inhibits their growth. Antimicrobial medicines can be grouped according to the microorganisms they act primarily against. For example, antibacterials (commonly known as antibiotics) are used against bacteria. Misuse of antibiotics, both on humans and on animals, leads to the emergence and selection of resistant bacteria to the antimicrobials. The abuse of antibiotic for curing viral infections (against which are ineffective) or minor diseases, it’s one side of the problem; but in my opinion another threat for human health could be introduced in the food chain by the animals. They are cured with too much antibiotics and they are greatly helping the development of more resistant micro-organisms, transmitted to humans via meat and also released in the environment through their droppings. It’s a problem well known to the Health Authorities all over the world, and just some days ago I read an interesting “European Parliament resolution of 27 October 2011 on the public health threat of antimicrobial resistance”, published on the Official Journal of the European Union at the following link. Today has been published an EFSA-ECDC (European Centre for Disease Prevention and Control) scientific report, based on the situation of 26 EU Member States in 2011 and referred to Salmonella, Campylobacter, Escherichia coli and Staphylococcus aureus. The conclusion seems to be positive, the risk low and the co-resistance to two critically important antimicrobials remains low, such as the multi-resistance. Nonetheless must be stressed that the report refers to 2011 and several voices in the scientific world – and also the WHO – seem to be not so optimistic. THE PROBLEM OF SUPERBUGS AND ANTIBIOTIC-RESISTANCE HAS BEEN ADEQUATELY DESCRIBED – WHAT WE NEED NOW ARE SOME SOLUTIONS. ONE SOLUTION IS USE PHAGE THERAPY WHEN ANTIBIOTICS FAIL. THIS COULD CURE PATIENTS, REDUCE COST AND FREE HOSPITAL BEDS! When it comes to antibiotic-resistant superbugs I think it is fair to note that we are dealing with a case of collective willful blindness since a cure for many such infections has existed longer than antibiotics have been used. In the book ‘Beyond Bullsh*t: Straight-Talk at Work’ author and professor of management at the University of California, Samuel A. Culbert, introduces the concept of mokita meaning “the truth everyone knows but no one speaks”. The mokita or paradox of the antibiotic-resistant superbug problem is that we have known how to treat some, perhaps even most, antibiotic-resistant superbug infections since before antibiotics have been used to treat bacterial infections. A recent BBC interview on phage therapy, as this medical treatment is known as, can be found at: http://www.bbc.co.uk/iplayer/episode/p015cdyn/Health_Check_Bacteriophages/ . While I do not believe that phages will ever replace antibiotics, it is my opinion that we need all available technologies to control superbugs and technologies that work by very different methodologies are important to break the cycle of resistance development – phage therapy is one such technology. One of the simplest ways of getting up to speed on phage therapy is to use google/videos and look at the videos in German, French or English (those are the languages I can watch). I am sure most people will come to the conclusion that phages should be used when antibiotics fail. Timely comments Cesaro. Multiresistant bacterial strains are certainly a worldwide problem. However, I disagree with your emphasis on the use of antibiotics in animals as the major problem. Misuse of antibiotics happens both in human and animal medicine. The use of antimicrobials for growth promoting purposes should certainly be phased out. But in my view the spread of multiresistent strains among humans is much more related to inappropriate use in human patients than in animals or even patients not following instructions and stopping treatment too early. There are cases where transfer of multiresistent bugs from animals to humans has been proven, a recent Danish finding is a case in point. But this is probably not the major pathway. Thank you for both your great comments. Stefan, you are the food science guru :), so I take good note of your point. In Italy, as in the recent Danish case, I’ve been to a seminar in which was stressed this possible way of transfer, as well as the transfer from animals to soil bacteria. I’m searching some material for you, but all the articles that I have are in Italian! 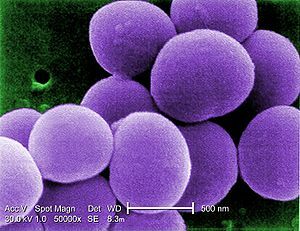 Recently read Maryn McKenna, 2010, The Fatal Menace of MRSA – SUPERBUG. If I remember right, all these avenues are important – the book has an unbelievable large collection of references.